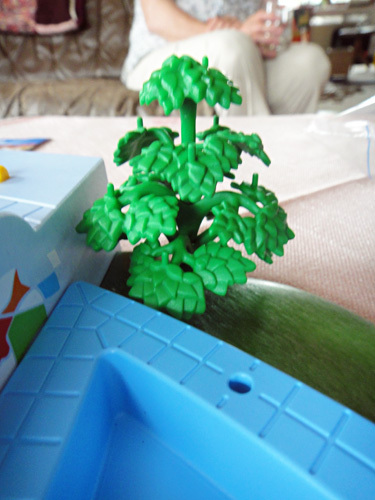 The tree blog is back! And we're getting started again with my favorite part, Saturday story time! 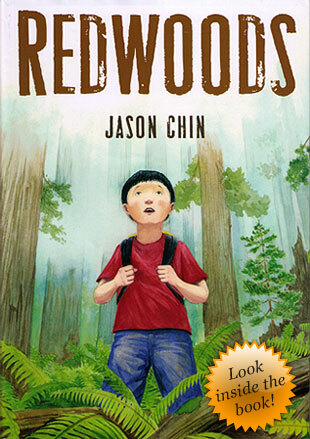 Today, I have a fabulous book to share: Redwoods by Jason Chin. That sticker is no advertising gimmick. This book just begs to be opened. It is beautiful, fantastical, irresitible. 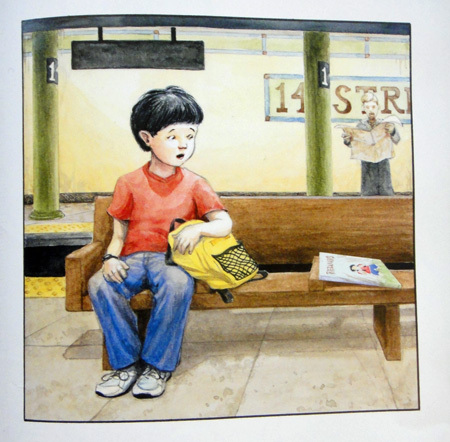 Although Chin is writing a non-fiction book, he chooses to use a narrative structure, showing us a young boy who discovers a book - this book - on a bench in the 14th Street subway station. The boy picks up the book, hops on his train, and begins reading. 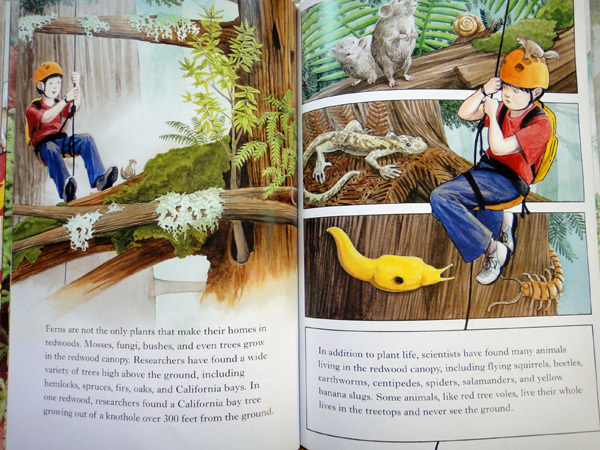 As we read that "the coast redwoods'... ancestors lived about 165 million years ago," we see dinosaurs appear in the window behind the boy. 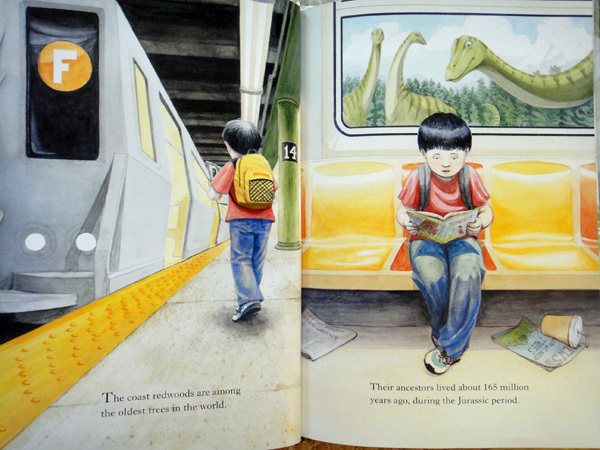 We read that "there are trees alive today that first sprouted during the Roman Empire" and two Roman figures appear next to the boy in the subway car. When he exits his train, we read that "redwoods have shallow root systems," and we see roots creeping down from the subway station ceiling. 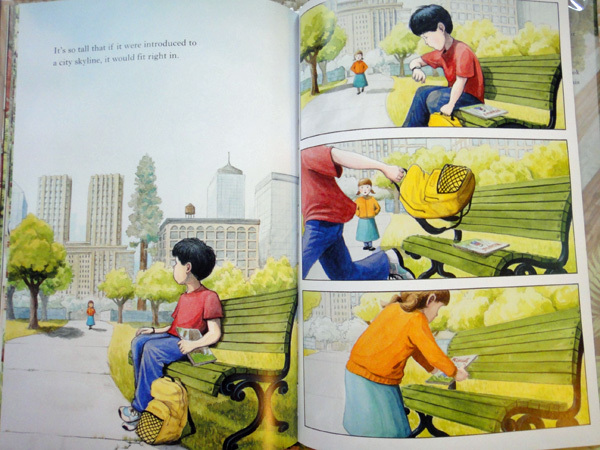 Step by step, as he progresses in his book, the city is disappearing until the boy comes up out of the subway to find himself in a forest surrounded by the otherworldly trees he's been reading about. He walks among the trees. He finds a seed, "a one-inch-long cone" that with "enough light and water... can grow fast - up to two feet per year." From down below he experiences the "artificial rain" produced by fog condensing on the needles of the tree, an ingenious way the redwoods get water in the summer months. At the base of one tree, he discovers rope, a helmet, and another book, How to Climb Big Trees. He climbs up into the canopy to explore the trees from above. We learn that the soil produced by decaying needles caught between the branches of these enormous trees is rich enough for other plants, and even other trees, to grow in. The boy discovers many animals that live here in the canopy and sees how new trunks grow and crisscross into each other high above the ground. There's a lot of information packed into the middle of the book here. And there needs to be because the end of the book, like the beginning, moves slowly, transporting us this time back to the city. As the boy learns just how tall these giants are, the city starts to return. 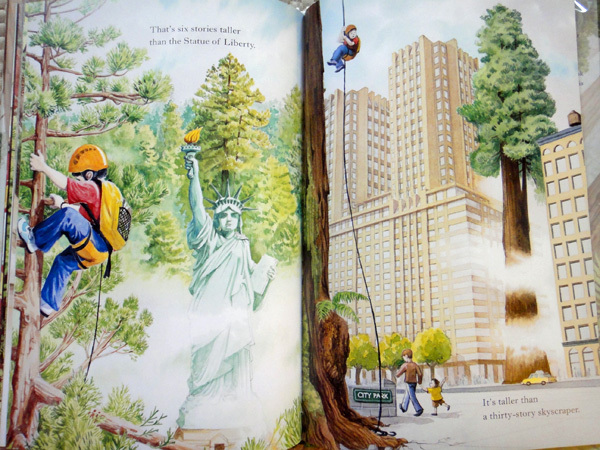 "...six stories taller than the Statue of Liberty...taller than a thirty-story skyscraper..."
A book IS magical; in a book, a boy from the city can take a trip to the redwood forest. And these trees are magical too. 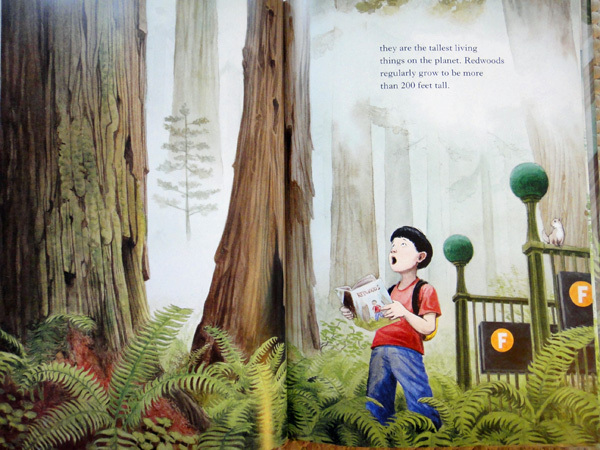 You can tell that the author appreciates the magic of both trees and books. 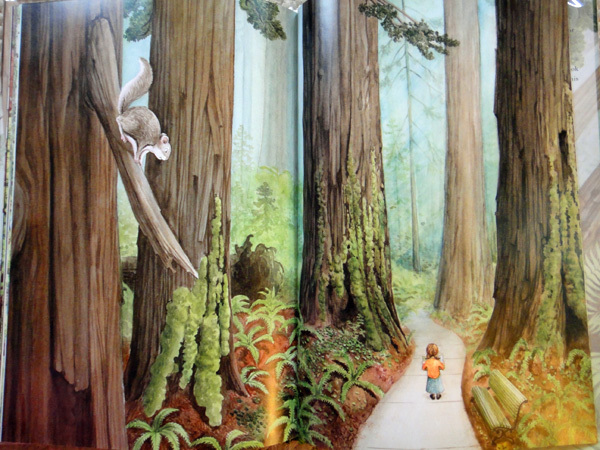 Check out an interview with the author where he talks about his inspiration for the book at The Green Guide for Kids and see his pictures from his own trip to the California redwoods on his website. We've kept pretty busy here on vacation in Germany. Each year, we manage to find some new things to do. And as the kids get older, we also find that there are more things they CAN do. 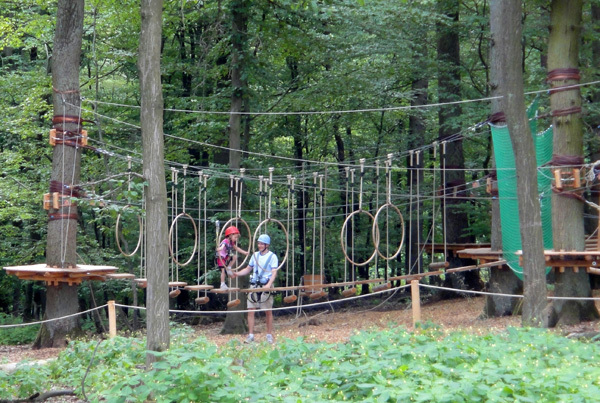 Last week, we spent an afternoon at an amazing adventure climbing park outside the city of Marburg. 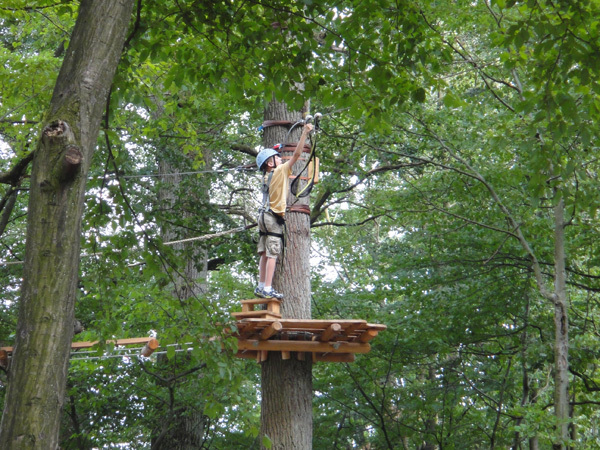 That's one of my sons up in a tree, clicking into the safety rope to glide down at the end of a course 6 meters above the ground. 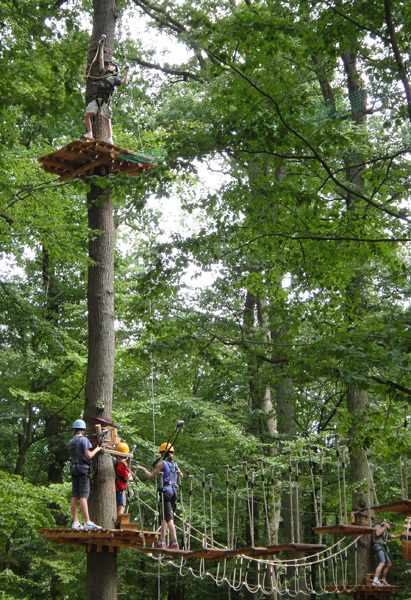 Here's my other son getting ready to do the same thing at the very top of a course 10 meters high. I did not go on any of the courses because I am crazy scared of heights. I mean, seriously, those trees are wicked tall! The trees were amazing. 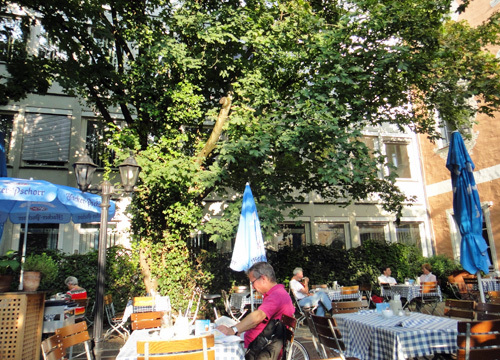 You can tell that the Germans love their trees and they take care of them. 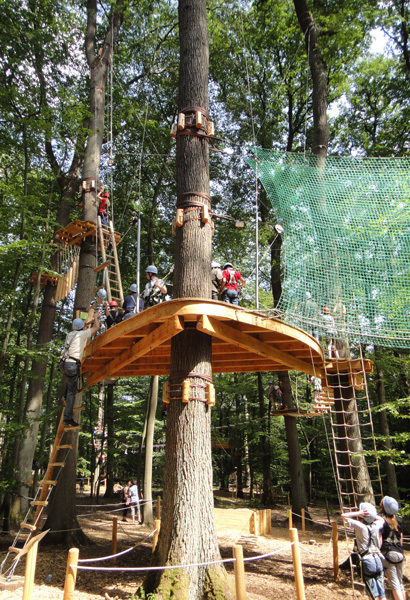 Take a close look at the structures and supports of the climbing platforms and obstacles. There's not a nail anywhere. Everything is held in place with bands and straps. All to keep from harming the trees. The woods all around look just like this one where the Kletterwald was located. The trees are tall and skinny, bare trunks with a few tufts of foliage at the very top. It looks like someone has put tiny Christmas trees on the top of some telephone poles! 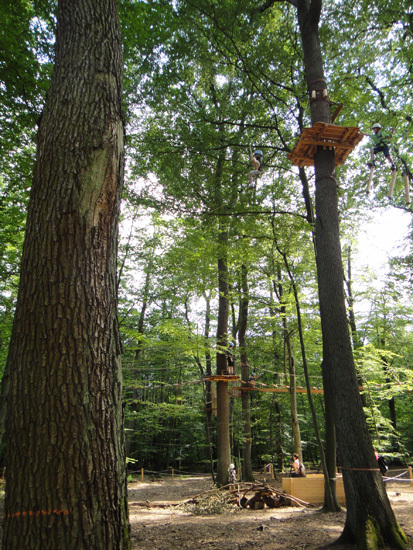 After driving past a few woods, I first thought that the Germans stripped a lot of the lower limbs off of the trees. But when I realized that EVERY forest had trees that looked like this, I decided that they must just grow like that. I guess the lower branches die and fall off when they aren't getting the light anymore. All of the trees in the Kletterwald seemed to have the same kind of leaves. 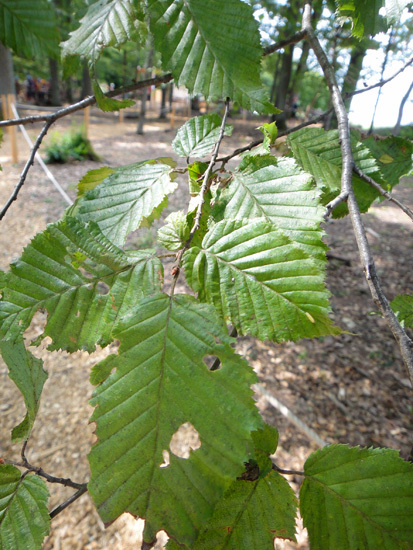 Broad, flat leaves with toothed edges and many veins coming out of a central vein. Are they elms? Birches? I need a German tree guide! This summer I'll be continuing my studies to become an elementary school teacher by taking a class in children's literature. 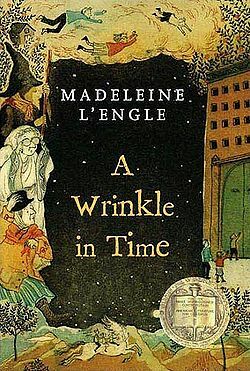 In preparation for the class, I've been looking at some classics of children's literature and I couldn't help noticing and highlighting a few beautiful (and not insignificant) passages about trees. 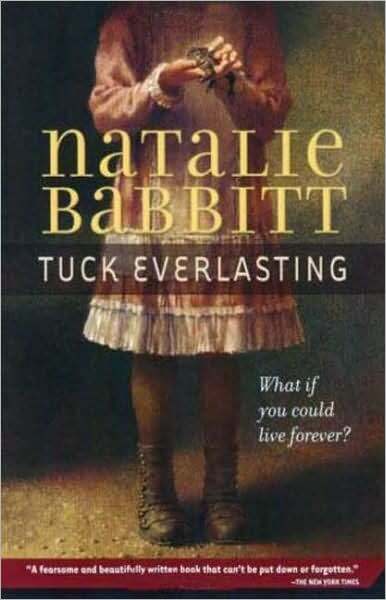 One of these is in Natalie Babbitt's Tuck Everlasting - a book I remember reading as a child. 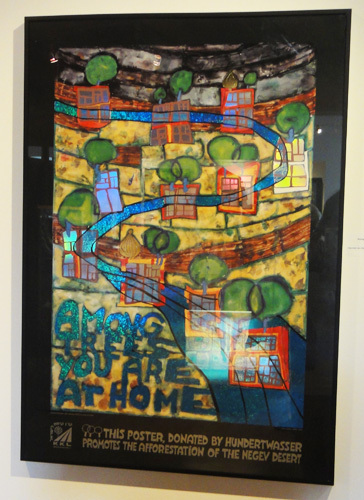 Babbitt writes in the prologue that Treegap wood "was at the center, the hub of the wheel" that connects the events and the people in her story. We soon learn that at the center of the wood, there is an ash tree. In the end, however, it was the cows who were responsible for the wood's isolation, and the cows, through some wisdom they were not wise enough to know that they possessed, were very wise indeed. If they had made their road through the wood instead of around it, then the people would have followed the road. The people would have noticed the giant ash tree at the center of the wood, and then, in time, they'd have noticed the little spring bubbling up among its roots in spite of the pebbles piled there to conceal it. And that would have been a disaster so immense that this weary old earth...would have trembled on its axis like a beatle on a pin. "You know the old shingled house back in the woods that the kids won't go near because they say it's haunted? That's where they live." "Mrs Whatsit and her two friends." They were standing on a sunlit field, and the air about them was moving with the delicious fragrance that comes only on the rarest of spring days when the sun's touch is gentle and the apple blossoms are just beginning to unfold....They had left the silver glint of a biting autumn evening; and now around them everything was golden with light. I remember thinking as a kid that these long descriptions were so boring, but these are amazing and give you such a vivid sense of what the kids are experiencing. I am surprised at how the trees can be used to communicate so much about their feelings and surroundings. 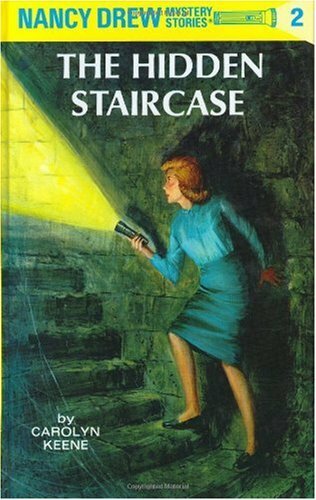 Another book I've started is the second book in the Nancy Drew series, The Hidden Staircase (a series that I used to LOVE!). From the road one could see little of the house. A high stone wall ran along the front of he estate and beyond it were many tall trees. Nancy turned into the driveway which twisted and wound among elms, oaks, and maples. Presently the old Colonial house came into view. Helen said it had been built in 1785 and had been given its name because of the two elm trees which stood at opposite ends of the building. They had grown to be giants and their foliage was beautiful. Oh, well, thank goodness Nancy told us it was charming. Because that description didn't. 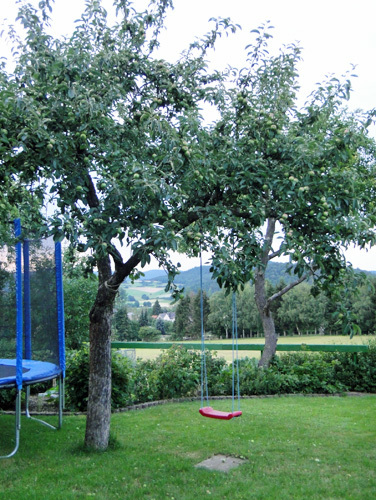 It sounded like it was from a rental listing or something: "Charming tree-lined view. With ghost."